When I set up this blog, many of my friends were very enthusiastic about the cooking, food and recipes section. In particular, many were very excited about having access to the many Gujarati recipes I aimed to share. While at university, I use to do a lot of cooking and many of my dishes were Gujarati which always went down well with my fellow flat mates! 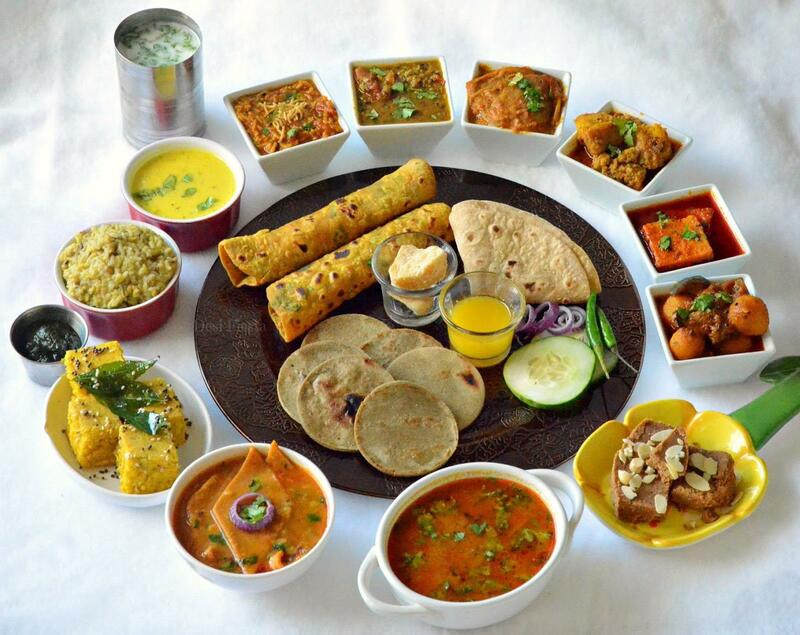 Gujarati food mainly comes from the Gujarat region of India where a majority of people are strict vegetarians, often omitting the use of onions and garlic primarily due to the heavy influence of Hinduism and its teachings. There are some distinct differences in food habits and methods of food preparation throughout Gujarat too, owing primarily to the climactic and cultural variations. Ingredients like yogurt, buttermilk, coconut, groundnut, sesame seeds, lime juice, fresh herbs sugar are commonplace in Gujarati food preparation. Furthermore, the spice level and flavour of Gujarati foods is regional as well as to the taste preferences of individual family’s. Gujarati food is a highly distinctive type of Indian cuisine which is very often served along with basmati rice and a range of wheat breads, such as Chapati, Naan, Thepla, and Poori. Most people love Gujarati delicacies like crisp spicy fried savoury cuisines and sweets made of milks and purified butter, also known as ghee. The popular Gujarati plate or ‘thali’ as it is known is served in homes, in restaurants, at marriages and many other events and festivals and comprises of savouries, sweets, rice, dals, wheat breads, sweet and sour chutneys and pickles. This balance is very much due to the blending of the sweet and the salty which clearly distinguishes Gujarati food from other Indian varieties. Gujarati food typically consists of rice or chapatis, pulses, vegetables, salads, papad (poppadums) and yogurt. It is very often nutritious and balanced. Many of the recipes I will share with you can be adapted to suit different tastes and I aim to incorporate flavours from major regions of Gujarat ranging from sweet, salty and spicy. In my family, our food is traditionally mildly spiced and does not include onion although in some dishes we do incorporate garlic, however, overtime I have adapted some of the dishes to include both to give it an authentic flavour. If any of you have any questions about Gujarati food or cooking then please do contact me through the comments below. I would appreciate if you could help me asap. I have friends in central Florida who are Gujarati and I want to get some herbs/seeds that the mom can grow in her garden. I wanted to get her a variety that were easy to grow and that she might be happy to receive. I know she grows lemongrass, but I don’t know what else. Are there any spices/herbs that you would recommend that she could actually grow? Are there any plants/seeds that would “wow” her? They have been very good to me and I just wanted to find something (they want for nothing) that I know she would really enjoy. It’s for a Christmas gift. Thanks for any input! Hi. Thanks for liking My Easy Suppers. I don’t normally contact ‘fans’, otherwise I’d spend all day doing it! But as soon as I saw your screen name, I had to contact you. My 2nd wife’s family came from Gujarat originally, via East Africa, just like you. She’s a lovely person (we’re still good friends), and I was part of a Gujarati family for many years. So it’s great to see what you’re doing with your Gujarati food web presence. Very well done – and best of luck with everything. Thank you so much for your heart warming comments! It’s lovely to hear from people who are following the blog and like what they see. I’m very grateful for the feedback back too. If there is anything in particular or a recipe you would like to see then do let me know. Thanks once again!